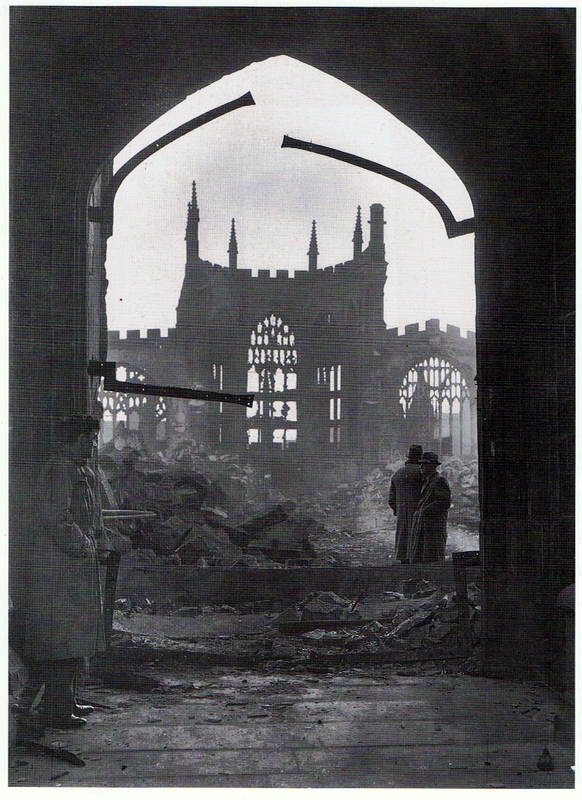 This coming weekend, Coventry remembers the trauma it suffered on the night of 14-15 November 1940, when the Luftwaffe destroyed the Medieval centre of the city, including its old Cathedral in its ‘Moonlight Sonata’ raid of three major waves of aerial bombardment which gave a new word to both the German and English languages for this form of blanket bombing, Coventration. My mother, then nine years old, Daphne Gulliver, had vivid memories of this night, but also the previous significant air-raids on Coventry, and the first use of the communal shelter at Walsgrave-on-Sowe school. The Anderson shelters that people had put up in their gardens by the summer of 1940 had become flooded so they had to go to the shelter at the school, which had been put there for the school children. However, as there were no day-time raids, it had not been used, and was still locked. The schoolmaster, Gaffer Mann, refused to open it, however. A pick axe had to be sent for to break the lock, and all the residents of School House Lane went in. Though Walsgrave itself was of no military importance, Capability Brown’s huge landscaped pool at nearby Coombe Abbey was in the German map books and was used as a landmark by the German bomber crews. The Rolls Royce Engine Factory at Ansty was less than a mile from this, manufacturing aircraft engines. There was also an aerodrome there, built before the war, and the then Rootes assembly plant at Ryton was only a few miles away on the same side of the city, with its shadow factory producing aircraft and military vehicles. Built after 1938, these factories did not appear on the Luftwaffe’s maps, hence the importance of incendiary bombs dropped around the outlying areas of the City, as well as on the city itself. The Germans were searching for the shadow factories on the ground, using the Coombe Pool as a focal point. Later in the war, the order was given for it to be drained. Most of the locals on the estate thought that this was, by then, totally unnecessary, and it became something of a joke since, they argued, the measure had been taken at a point when the enemy bombers were equipped with electronic guidance systems and no longer needed landmarks to locate potential targets. Other forms of defence were brought onto the estate, with a barrage balloon and an Ack-Ack station being positioned in the field adjacent to the old Gas Cottages. However, during one enemy raid, a stick of bombs fell on the western end of Coombe Pool. Later inspection, following the all-clear, revealed that little damage had been done. A short time later, however, a panic-stricken farmer drew the attention to of several nearby residents to a whirring sound coming from within the estate out-building where he had garaged his Humber car for safe-keeping. Fearing that it might be coming from an unexploded bomb, great caution was exercised while an investigation took place. It turned out that the noise was being made by the horn of the car, which had malfunctioned due to the vibration from nearby explosions. Huge craters were left on the landscape between Walsgrave-on-Sowe and the Coombe Estate for many decades afterwards. Seymour described his arrest, as an ARP Warden, of a German pilot who had bailed out over Coombe Park, landing in the farm lane and breaking both his legs. Seymour had to use his bicycle to get the airman the mile or so to the village police station. School records for 1940 show that a total of six hours and ten minutes was spent in the school shelter, with one visit lasting over two hours. Of course, nearly all the raids took place during night-time. The first raid affecting Walsgrave was on 2 August, mentioned in the School Log Book as taking place at 3 a.m., affecting the morning attendance. Bombs fell regularly on the village over the next few months, one landing on the allotments on the Henley Road, and another near the old Craven Colliery in the same area. A third landed near the village centre, close to the Working Men’s Club. There were a great string of incendiary bombs that landed in the back fields, making huge craters. The villagers formed a fire watch, someone from each house taking a turn to do the watching. Walsgrave was not itself of any military importance, but the nearby Ansty aerodrome was raided, where there were part-time RAF lads. The first major raid on the city itself was recorded on 18 August, when fourteen bombs fell on the other side of the city from Walsgrave. 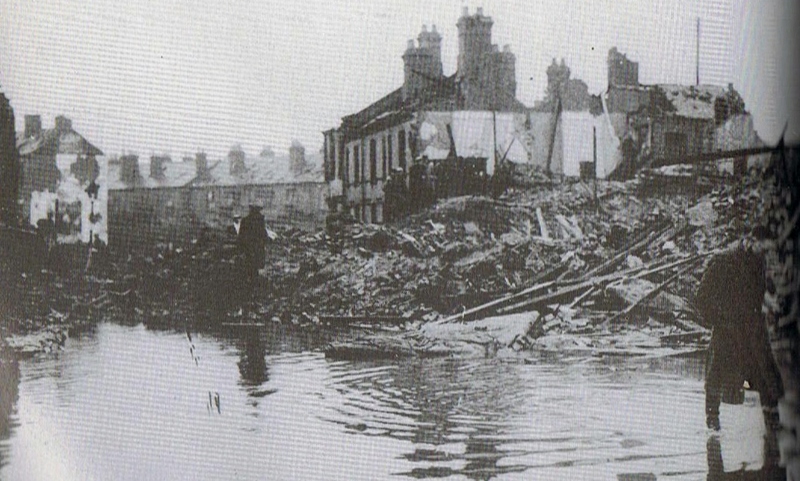 The first raid in which people were killed took place ten days later when thirteen bombs were dropped in the Hillfields district, just north of the city centre. Sixteen people were killed and three hundred houses were damaged. Between 18 August and 12 November, Coventry was attacked on twenty-four occasions. Few parts of the city escaped some damage and a total of a hundred and eighty-nine people were killed, with two hundred and sixty seriously injured. Nevertheless, the raid of the 14th/15th November was not detected until after 3 p.m., the end of the school day. On that night, Coventry was subjected to an eleven-hour sustained blanket-bombing, giving the German dictionary the word Coventration as a synonym for this type of raid, which was entirely different from the previous Blitzkrieg lightning raids, which had been the strategy in attacking London and other regional ports and cities, as well as in the previous attacks on Coventry itself. Though the sirens went off earlier than usual that evening, most people recall being at home having had tea or supper when the bombing started. The 449 bombers raided the City for almost eleven hours. Many of those rescued in the areas around the city centre were still under rubble until about 7 a.m., having been trapped for more than twelve hours in some cases. Five hundred and sixty-eight people were killed and eight hundred and sixty-three were seriously wounded. Two-thirds of the medieval city centre was either completely destroyed or badly damaged. St Michael’s Cathedral, Owen Owen’s iconic department store, the Empire Theatre and the Market Hall were among the more important buildings destroyed. One hundred and eleven out of the one hundred and eighty factories sustained some damage, the worst hit being the Daimler Factory at Radford, the GEC in Whitefriars’ Street and British Thomson Houston in Alma Street. Even more damaging, electricity, gas, telephone, transport and water services were all severely disrupted. About twelve per cent of the city’s houses were rendered uninhabitable or destroyed. We put up the cushions from off the furniture and put them on our heads and went running up the shelter. It was a bright moonlit night and tracer bullets were flying around everywhere and the whole city was on fire. Everything was lit up like it was daylight; it was a most awesome sight and of course, for days afterwards, the burnt paper was coming down. School reassembled – about only 130 were present – this is due to the results of a terrific 11 hour raid on Coventry and immediate neighbourhood. The Church Hut used for 70 to 80 infants had to be used as a home for the people who were bombed out of the city. Seymour Gulliver was on air-raid duty that night and recalled the effect of one bomb that had fallen in what was known as The Hollow, just past The Mount Pleasant. He said that the old, cruck-beamed cottage was quite badly damaged as the patrol went towards it, and he was sure there would be at least one person dead inside. But when they went inside they found that the main beam had fallen across the fireplace and the family were all protected by it, around the fireplace. Miraculously, no-one was hurt. The village had escaped lightly compared with the mass destruction of the city centre and the older factory areas in the suburbs, though it might have been a different story had the Luftwaffe been able to locate the Ansty and Ryton factories. Many in the village realised this vulnerability, and though not forced to, sent their children away to safer rural areas, if they could. Daphne was sent away to relatives near Bridgwater in Somerset for a while. There were eighteen more raids to come of which two were particularly serious and approached the destruction of 14/15 November 1940. They took place within forty-eight hours of each other in April 1941. On the night of 8/9 April two hundred and eighty-nine people were killed and five hundred and seventy seriously injured while on the following night a further one hundred and seventy were killed and one hundred and fifty-three were seriously hurt. The first raid lasted for over five hours, and the second for almost four and a half. These raids saw the destruction of Coventry and Warwickshire Hospital, St Mary’s Hall (a medieval guildhall) and King Henry’s School. There were also direct hits on the Council House, the Central Police Station and the London, Midland and Scottish Railway’s Goods Office, in addition to forty-two factories, of which four were seriously damaged. Thirty thousand houses were also damaged and public services again seriously curtailed. Following the November 1940 raid, lack of electricity, gas and water supplies was largely responsible for around twelve thousand workers being made unemployed on the morning of 15 November, but within two weeks eighty per cent of them were back at work. Similarly, after the April raids 108 factories were deprived of their normal gas supplies, but half of them had had them restored within ten days and the rest in just under another week. One factor that aided industrial recovery was that damage to buildings was greater than damage to the machinery inside them. Coventry showed that even the most intense bombing would not, of itself, bring about permanent damage to a city’s economic life. The map above shows the German dispositions for the raid of the 14/15 November on Coventry. There is still a great deal of controversy about whether the attack could have been mitigated, with some believing that the City was deliberately sacrificed by government officials, perhaps sanctioned by Churchill himself. Was Coventry sacrificed to keep the Enigma secret? During the 1970s a story developed about the November Raid, following the publication of a series of accounts of how Allied cryptographers had, early in the war, broken many of the German military codes. The essence of this new theory was that the impact of the raid could have been limited by countermeasures because it was known in advance that Coventry was to be the target on 14 November. The reason that nothing was done and nobody was warned before the first sirens sounded at 3 p.m., was that the Government did not want to do anything which might suggest to the Germans that their codes had been breached. As the centre of British aircraft production, Coventry had already attracted the attention of the Luftwaffe, the previous attack coming just two nights before, and would clearly do so again, but it was the scale and length of the bombing which surprised its citizens, plus the deliberate and concentrated targeting of its medieval centre with incendiary bombs, obviously designed, not just to demoralise them, but to help the bombers find their main targets, the factories. Coventry’s defences had been strengthened earlier in the month, and on 11 November Air Intelligence had learned, via Enigma, that the German Air Force was about to launch a large-scale night raid led by the Pathfinder Squadron (K. Gr. 100, based at Vannes) using target-finding radio beams. The operation was code-named Moonlight Sonata, suggesting a three-stage raid, since the Beethoven composition had three movements rather than four, beginning with its well-known adagio (slow movement). The name also suggested that the raid would take place at or near the time of the full moon. A captured German airman had also mentioned the raid and had named the target as either Coventry or Birmingham. His evidence was ignored because the captured map pointed to targets around London. Also filed away was some further Enigma information, collected between 12 to 14 November, which gave the radio beam bearings for three targets; Birmingham, Coventry and Wolverhampton. It was thought that these were part of experimental German transmissions which had been going on for some months unaccompanied by actual raids. London was still thought to be the target for Moonlight Sonata, although the air ministry told Churchill that if further intelligence came in, they hoped to get instructions out in time. At 1 p.m. the Luftwaffe beam tunings clearly showed that the raid was to begin two hours later and that the beams intersected over Coventry. However, attempts to jam the beams failed and the fighters who went up to take on the Germans failed to find them. The anti-aircraft batteries also performed poorly. Although historians have concluded that there was no conspiracy, but rather a series of operational failures, it is clear that a Civil Defence warning could have been given to the City well before the raid began, as well as to the central government agencies operating there, especially the Ministry of Home Security. Different people who were living in the town, ’cause they weren’t getting any sleep, they came out to these houses out here to sleep. There were about eight I think, come out to my parents – sleeping all over the place, under the stairs in what we called the Glory Hole and there were that many of us at the November Blitz. In early October 1941, the Friends’ (Quaker) Ambulance Unit carried out an enquiry on the nightly exodus from Coventry, producing an eight-page report. The Coventry police estimated that as many as a hundred thousand people, more than half the registered population, were sleeping out during the main raids. The Deputy ARP thought that the number was about seventy thousand earlier in the year, but that it was still of the order of fifty thousand that October. The local Medical Officer agreed with these latter estimates, although another ARP officer thought the number had fallen to about twenty-four thousand. The Midland Red bus company said that they were carrying about five thousand more passengers into the Corporation’s area than they had been doing before the Blitz. The report concluded that the numbers leaving the city at the time of the raids was between seventy and a hundred thousand and that this had fallen to fifteen to twenty thousand at the time the report was compiled. Of course, much depended on the geopolitical definition of the city, since the area controlled by the City Council had grown to incorporate villages like Walsgrave-on-Sowe, three miles from the centre, but still, in 1940-41, almost surrounded by farmland, though far from being entirely safe from bombing itself. However, many adult munition workers might have felt it a safe enough distance for them, even if the villagers themselves had evacuated their own children to family and friends outside the Midlands. Whatever the true scale and nature of sleeping out, the figures of those leaving their homes before nightfall was certainly large and would have grown to fifty thousand if bombing had returned during the winter of 1941/42. Certainly, the earlier, more minor raids of 1940 had made people nervous, and many must have been severely traumatised by the events of 14/15 November, especially the children, but there common sense reasons for a nightly evacuation. If you were hard at work in a munitions factory all day you needed your sleep at night. It is also interesting that of 2,200 workers appearing before the local Labour Supply Committee asking for a transfer after the November raid, two thousand were persuaded to stay. There was, understandably, some nervousness about restarting the night-shifts in some factories. After the April 1941 raids, the Deputy Regional Commissioner went out of his way to praise the morale of Coventry people, declaring that there was no panic and nothing in the nature of a general trek from the city. Nor is it true, as some suggested after the war, that the workers who had settled in Coventry from the depressed areas fled the city as soon as they could catch trains on 15 November 1940. Their names and birthplaces, in the civic Roll of the Fallen, show that they suffered in equal proportion to those born in Coventry and Warwickshire. For some days after the raid, most of us were cut off from the ordinary sources of news and hence we did not realise how famous Coventry had suddenly become. It was, I think on the Monday that telegrams and messages from all over the country, and indeed, the world, began to pour in, and we learned what a deep impression had been produced by the manner in which Coventry had stood up to its ordeal. Undoubtedly the war brought into existence for a time a stronger sense of community throughout the country… Dunkirk, the Battle of Britain and the Blitz produced a ’backs-to-the-wall’ solidarity that transcended class barriers and brought together all sorts of people in the Home Guard, Civil Defence, the air raid shelters and… to some extent the factories… the increased mobility of the population… tended to break down parochialism.